Are you still stewing about what gift to get for her? If she’s into hiking, then you’re in the right place. The tricky thing about hiking gifts for her is that you don’t want to give her heavy, bulky gear she’ll never use. Below, I’ve made a list of hiking gifts and gear that I either already own and love, or would love to get as a gift! 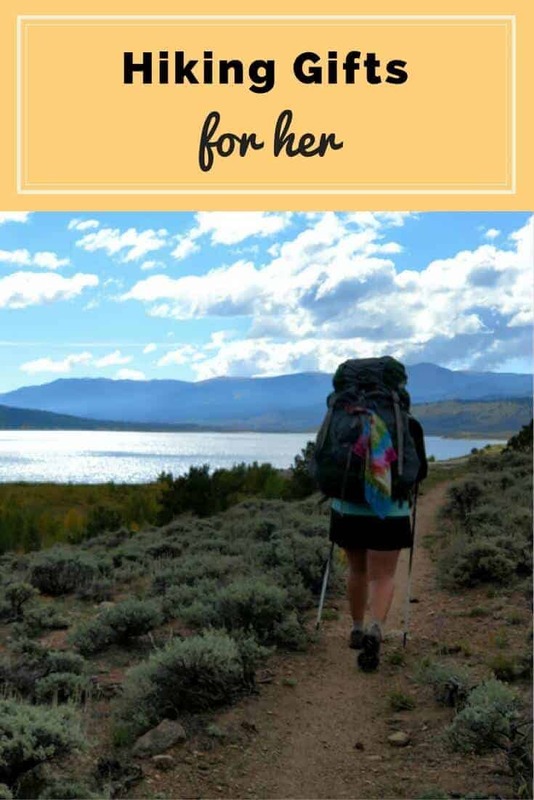 Hiking books or ebooks – I recommend Wild by Cheryl Strayed an inspiring story about a woman reinventing herself on the Pacific Crest Trail, or Grandma Gatewood’s Walk another inspiring story about the first woman to thru-hike the Appalachian Trail, in 1955. A new day pack. Some girls’ closets are filled with shoes and purses – mine is filled with backpacks of every size for every occasion and yet somehow, I always want a newer, better, slightly different one! 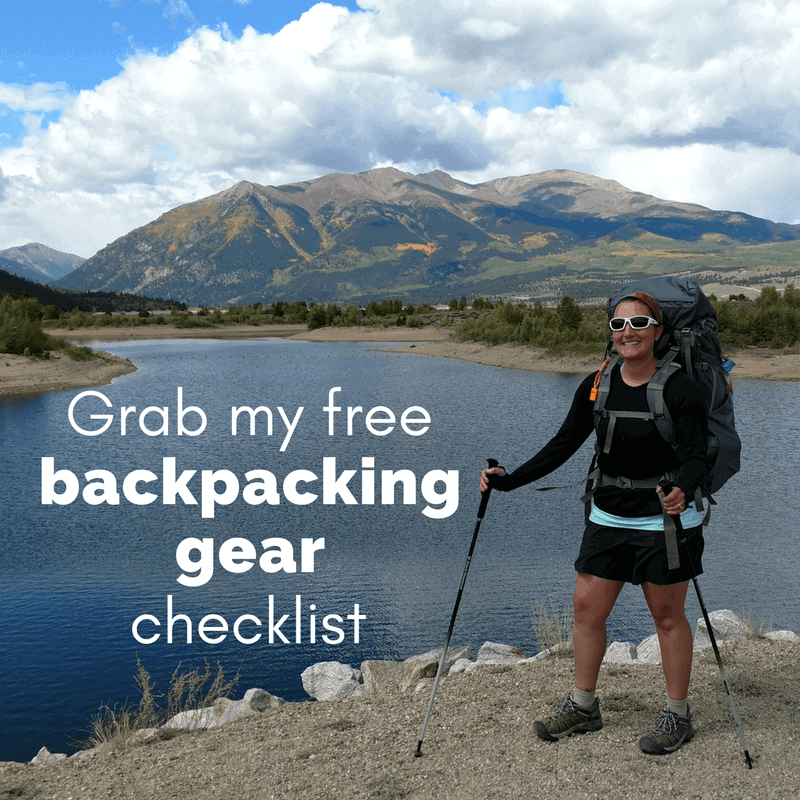 Especially if she’s new to hiking, you can’t go wrong with a good quality pack from REI, I stick with REI because they have some of the best customer service and return policy out there. Size matters – 2.5-3 liter packs are perfect for quick, local hikes, that’s just enough space to fit some water and a snack. 18-40 liter packs are great for day hikes, a slightly bigger pack is great for cold weather hiking so you can bring lots of extra layers. 50-60 liter packs are good for overnight backpacking trips but should be fitted properly for size before you purchase – so you might not want to surprise her with one of these or she’ll probably end up returning it, unless you’re replacing an old one you already know she loves. Take-a-wine bag. No hiker wants to carry a heavy glass bottle of wine around in their pack, and then have to carry out the empty glass bottle at the end of their trip. Transfer the wine into the lightweight, portable reusable bag, and you’re good to go! I usually take some sort of adult beverage out with me on short overnight trips, or just after a resupply in town when I was hiking on the Appalachian Trail, it’s a nice treat! Please always drink responsibly out there and watch out for dehydration. Good hiking socks. I know they aren’t the cheapest, but they’re the best. socks. ever. Once I tried Fits Socks, I never went back. That’s all I wear every day now, not just for hiking. They actually fit all the curves and contours of your feet, toes and heels so the sock doesn’t slip and slide around or slide down in your boots. A diva cup. Not all women will appreciate this – so use your best judgment. But I love mine! And I don’t think I ever would have bought one for myself because I was too unsure about the whole thing, but after being given one almost 3 years ago, I haven’t used disposable menstrual products since. Not only is the Diva Cup better for the environment, saves me tons of money by never having to buy pads or tampons, but I also never leak with it in which is amazing for hiking! And I don’t have to pack out used pads and tampons. It’s just a win all around. A puffy, down coat. I love my puffy! Living at 9,000 feet in Colorado it goes with me on most hiking and camping trips cause it gets cold out here at night all year round. My biggest regret though, is not buying one with a hood – so just something to think about. Outdoorsy jewelry, like this mountain ring. Again, use your judgment here, if she never wears any jewelry, this might not be the best idea, or if she never wears rings, go for earrings or a mountain necklace instead, you get the idea. A Serac hammock. 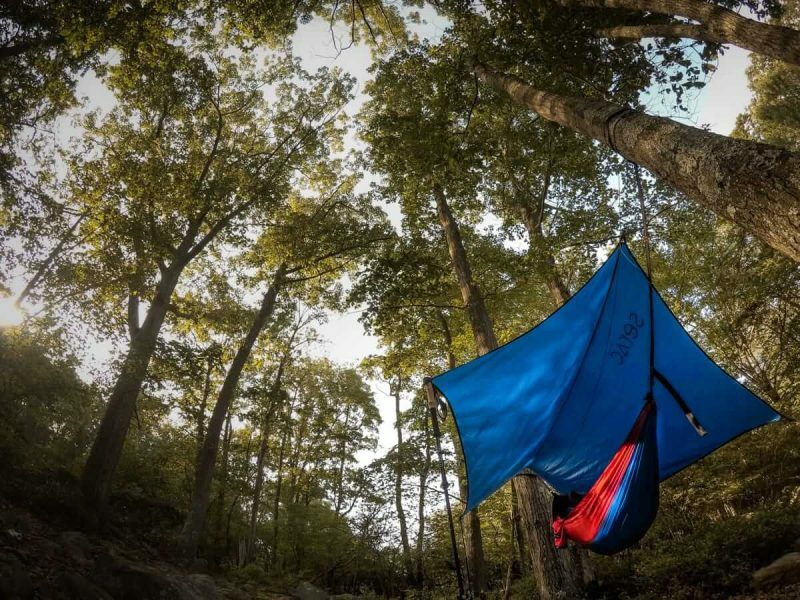 Anyone who spends time in the woods will appreciate a hammock to chill out in, either on day hikes or to camp out in on backpacking trips. All Serac hammocks come with straps and carabiners, so she’ll be able to set it up right away. If she’ll be camping out in it, you’ll want to get the bug net and rain fly too! 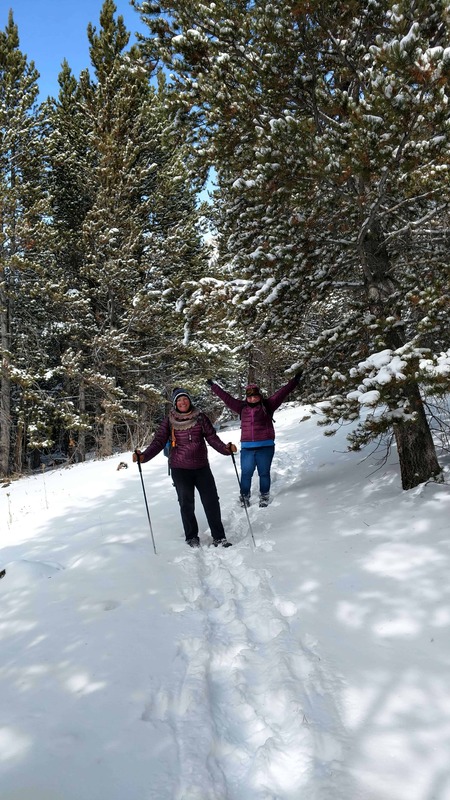 Don’t forget to use coupon code ADVENTURE15 for 15% off the entire Serac site. Mountain House meals. Mountain House meals are the convenience food of the backpacking world, it saves you from planning, preparing and portioning out every meal, and you can just add hot water to the pouch which means no pots to clean! I don’t recommend long distance hikers plan on these for every meal, but they are a nice treat every once in a while, or awesome for easy meals on a short weekend long backpacking trip. A buff, or a few. I love my buff and never hike without it. I usually wear it like a headband, it’s the only thing I’ve found to actually contain my crazy hair and keep it off my face. On hot days, I’ll dip it in a stream then put it back on to help cool me off a little bit. In cold weather I wear it as an extra layer around my neck, or to help keep the sun off the back of my neck too. At night, I use it as a ‘pillow case’ over my camp pillow (or bundled up clothes) to help keep backpacker funk off it. 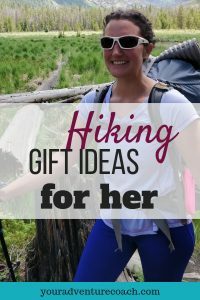 I hope this got your creative gift giving juices flowing and sparked the perfect hiking gift for her this year! 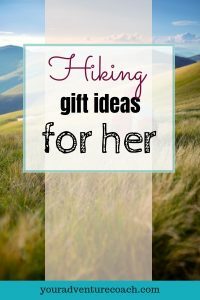 Feel free to share any other hiking gift ideas you have for her in the comments below.